Although the word itself is not in the verse, it does have that meaning. Let us now look and see what Prophet Muhammed (p) said on Jihad. In Sahih Bukhari, it is reported that helping your parents out and being good to them by respecting and obeying them is ‘Jihad’. 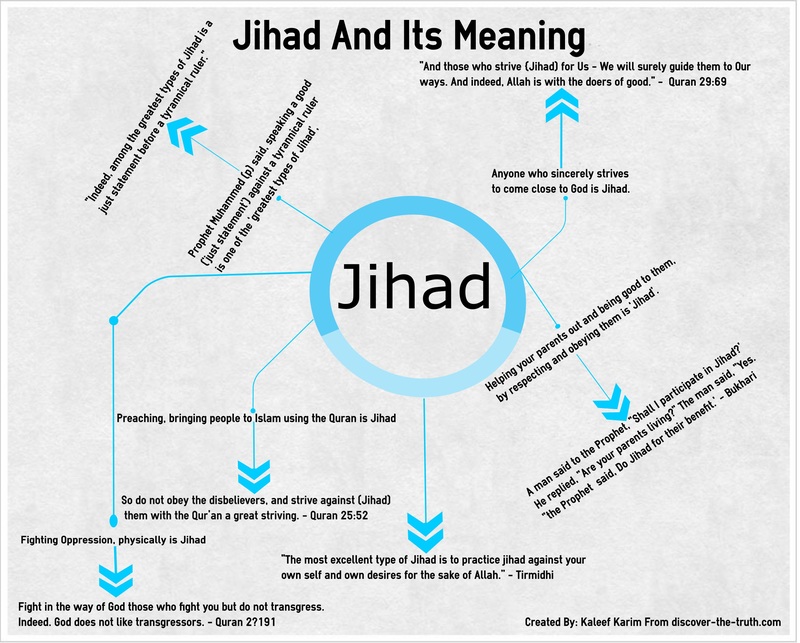 We see that the Arabic word ‘Jihad’ has many shades of meanings, such as bringing people to Islam with the Quran. Speaking a ‘just statement’ against a tyrannical ruler is one of the greatest jihads, as well as being good and respectful to your parents. Finally, physically fighting oppression, in order to be liberated from persecution is Jihad as well. Population jihad— creeping Sharia jihad— mosque building jihad— terror baby jihad— pedophilia jihad— banning alcohol jihad— fake hate crimes jihad— tv reality series jihad— handshake jihad— prom jihad— interfaith jihad— Arabic language jihad— religious accommodation jihad— immigration jihad— community fundraiser jihad— food jihad— civic participation jihad— stealth name jihad etc!